With an early fall harvest, spaghetti squash is available at the Farmer’s Market or at your local grocery store. This recipe only takes about 15 minutes of prep time. It’s healthy, sustainable, and easy to prepare! Let the squash cool.Meanwhile, heat your skillet. Toss shrimp with 1 teaspoon olive oil, 1 tablespoon of lemon juice season with salt and pepper.SautÃ© until cooked through for about 8 to 10 minutes. If squash is cool, begin to scoop seeds from squash and with a fork, scrape flesh into a bowl. Add shrimp, lemon juice,and 1 tablespoon oil to bowl. Toss to combine ingredients. Season with salt and pepper, parsley, and serve! We love shrimp and I tried this for the first time tonight. We use spaghetti squash almost exclusively instead of pasta. Cooked the spaghetti squash as I normally do (halved, seeded cut side down at 400 for 30 mins.) and THEN added the lemon juice, olive oil and seasonings while scraping the flesh. This kept these ingredients in the squash as opposed to the pan. Added capers and squash to cooked shrimp, heated through and it was fabulous. I wanted to make it a one-dish meal and this did the trick. Great recipe; we will be having this fast and easy dish often! Thank you! Harlan, spaghetti squash by itself is actually pretty tasteless, but as I indicated in my review, we use it as a really healthy alternative to pasta as in this recipe or with spaghetti sauce and your choice of chicken, meatballs or sausage. 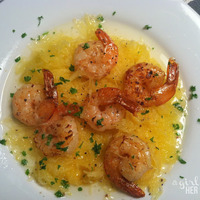 Just tried this, I had never eaten spaghetti squash before (don't like it). But this recipe made it taste good. I just added a ton of lemon juice.